Christiano Ronaldo took a nasty cut to the head during the Real Madrid match against Deportivo La Coruna at Santiago Bernabeu. He had given everything to nod a cross by Lucas Vazquez into the net, his second goal of the day. But the goal at the 84th minute came with a price: the cut on the head, which streamed blood on his usually handsome face. Ronaldo had broken a lengthy scoring drought to record the brace as Deportivo were routed 7-1 on Sunday. Defender Nacho Fernandez and Gareth Bale also recorded a brace each, with Luka Modric scoring the seventh goal. The Madrid striker caught a stray boot in the head as he powered a header past Ruben Martinez, Deportivo’s keeper. He stayed down on the turf thereafter. Even in the heat of action, however, the Portugal star could not help but check out the extent of the damage to his face. 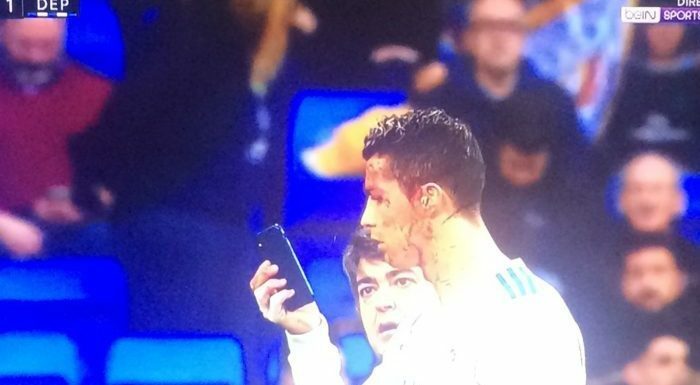 The medic’s phone was seized and Ronaldo looked at his reflection in the screen, as blood flowed down from the wound. Judging by his reaction, he was less than pleased to see his movie star looks distorted by the cut!